Retro Dress (worn as a top), Black Heels, Earrings: Thrifted. 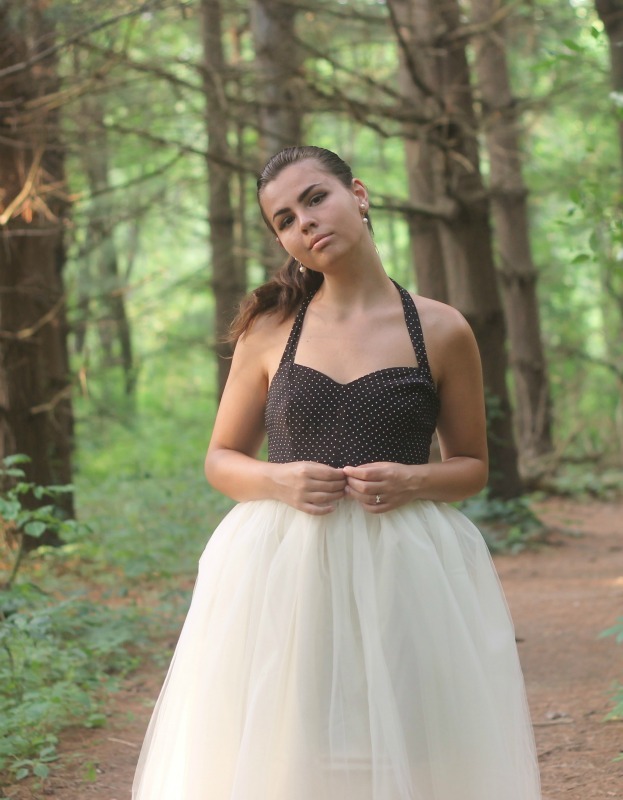 Tulle Skirt: c/o Kellie Falconer Designs. So I've been waiting a long time to share this with you and I'm so excited I finally get to! The lovely Kellie of Kellie Falconer Designs on Etsy hand makes the most stunning skirts. She has full circle skirts in romantic florals, vintage inspired ginghams, and my personal favorite; dreamy tulle. This is a skirt made for a true ballerina and I certainty felt like one! It was incredible quality with an elastic waistband wrapped in satin and better quality than most of the skirts I own. I was so enamored by the adorable, neat packing that Kellie had wrapped this skirt in & she even had a pretty business card tied with twine on the top. I am so thankful to Kellie for letting me style up this beauty and a bunch of other bloggers are doing so, as well! It's so much fun to see how all of the other ladies styled this same skirt up with their unique styles. Check out Alexandra, Christen, Kate, Kellie, and Kenzie outfits! Did you see you're featured on Modcloth's home page in their ad for their style gallery? I was excited to see you there! These photos made my mouth completely drop! You look like you're from a scene from a movie. Oh Lauren, you look like a beautiful ballerina! The halter neck is so gorgeous on you, and the tulle skirt is obviously stunning. Loving your hair like this, too! Beautiful! That top looks so great with the skirt! Simply gorgeous, Lauren! The timeless monochromatic styling is something I can picture Audrey Hepburn in... Tres Chic! Love your style! Saw your pics on Modcloth and wanted to check out your blog! This outfit is so gorgeous! You look like a ballerina in this pretty tulle skirt!